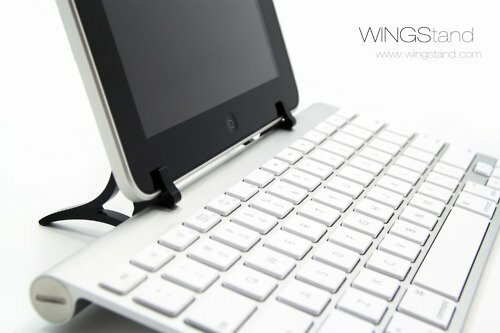 The WINGStand is a clever two piece plastic stand designed to work with the official Apple Bluetooth keyboard. It clips onto the Apple keyboard and then an iPad can be used in portrait or landscape mode; you can even use the iPad while it is in its case. The stand works with the original iPad, iPad 2, iPhone or even other tablets. If you don’t want to use a keyboard, the WINGStand also works fine as a stand for your device. The WINGStand has been developed by student Daniel Haarburger who is currently studying at Stanford University. It has already reached its target funding figure of $9,500 with more than 38 days remaining; looks like this one is going to be a very popular accessory. You can still make a pledge and guarantee yourself one of the first ones off the production line. $20 will get you one in white, $30 if you want an exclusive black one and you can even get a package including the Apple keyboard; that will set you back over $100. I really like the look of this and hopefully it will be available very soon. Take a look at the video after the break!